Good Morning, on this fine Sunday morning! 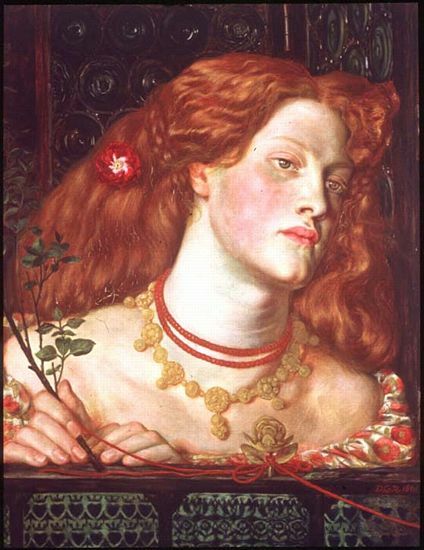 It seems appropriate that I'm reviewing a book about Mr God this morning, but fear not (should you fear such things, not sure why) this is a Pre-Raphaelite work of loveliness. 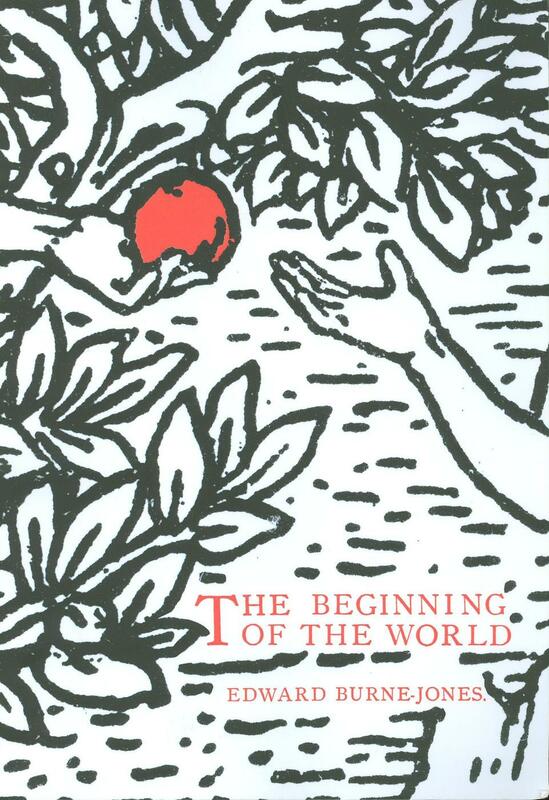 Today I am reviewing The Beginning of the World by Edward Burne-Jones. People who know me will know I own far too many Bibles. It's true, in our house we have double-figures of religious texts, and every time an elderly relative dies, I tend to get their Bible and book of Common Prayer. I love them, especially the ones with illustrations and so when I was sent this book to review I was delighted. 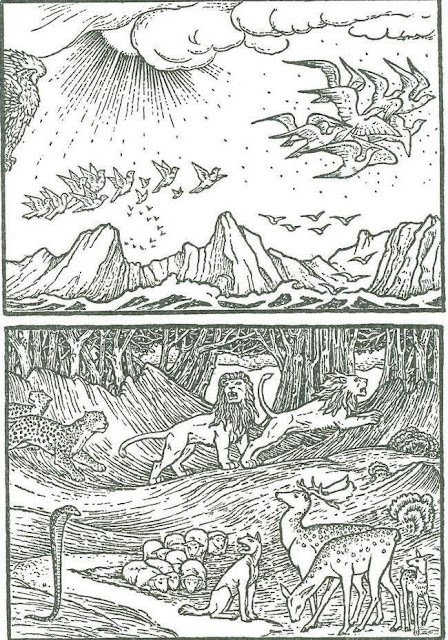 The idea was that the Kelmscott Press would print a Bible (can you image how amazing that would be?) 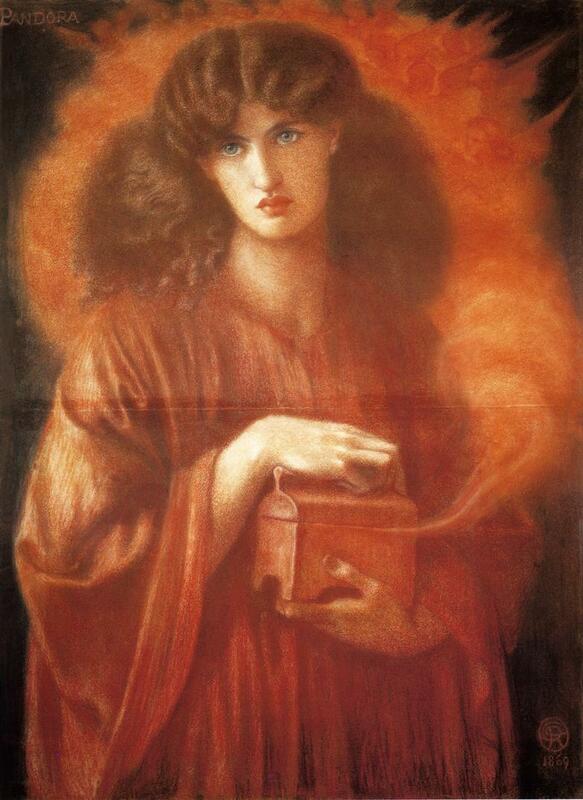 and so Edward Burne-Jones started work on some designs that would illustrate it. 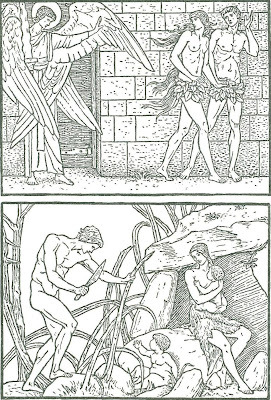 Sadly both he and Morris died before the book could be completed, so Georgiana published what had been created in 1902. 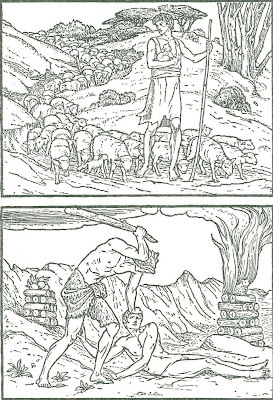 In this reproduction of the 1902 edition, the publishers have left in Georgiana's introduction which states that the illustrations were made for 'Mr Mackail's Biblia Innocentium' due to be published by the Kelmscott Press, and containing 200 pictures. 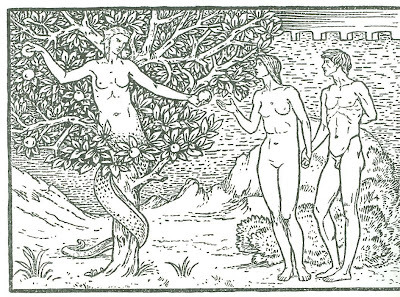 However only 25 were produced (from Genesis) and so Georgiana gathered them with the appropriate text passages. It's not a long book, only 23 pages long, and illustrated in black and white woodcuts throughout but it is charming and elegant in its interpretation of the scenes at the beginning of the Bible. Each little image is filled with detail, scales on the devilish serpent, apples on the trees and all of it is filled with Burne-Jones brilliance. If you are a fan of Burne-Jones' figures then you'll love this, as all of them are elegant and perfect, like they always are. I like that he never shies away from violence, and never trivialises it, but lends it a sort of shocking beauty. I find this to be true of his other work, such as the Perseus story, but look at the figures of the brothers above. 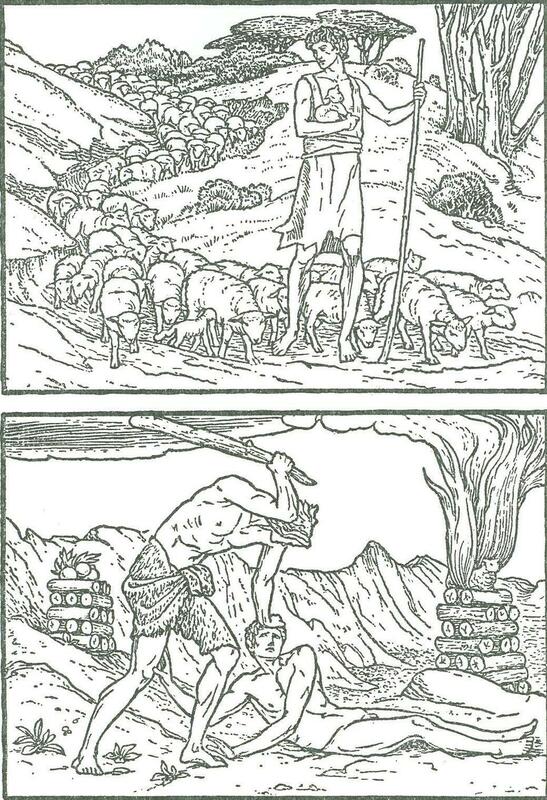 Look at the way that Abel reaches for his brother's legs in pleading, but Cain's hand presses his brother's head down, with the other arm raised in preparation to strike. To see what else the good people at Pallas Athene have in store go here. Here we go with the last part! 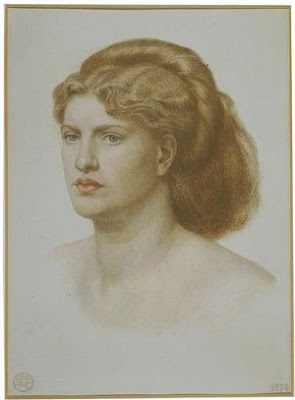 Remember I want you to give me your votes on all three sections: the oils, the drawings and today's category, the chalk pictures of Fanny Cornforth. While I adore the oil of this image, the pastel is delicious. Without all the clever detail and colour, Fanny stands before us, unadorned and leaning against a wall, awaiting her turn. I love the way her hair is pressed up on the right-hand side as she rests against it. The simplicity of the image makes it special. 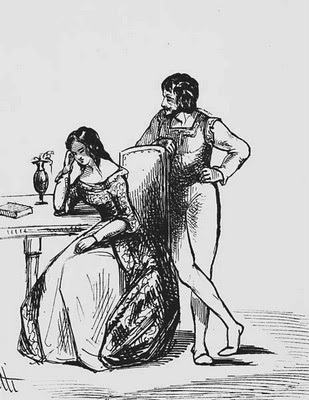 It is a woman waiting her turn with her lover, which, in 1861, was exactly what Fanny was. Despite the limited palette of colour used by Rossetti in his chalks, they normally have a very naturalistic look about them, unlike this striking rendering of Lady Lilith, aflame in red. Somewhere between 'Woman Combing Her Hair' and 'Lady Lilith', this picture has a domestic feel, unlike the finished oil of the punishing devil-woman. She is lost in thought, lost in her brushing and preparations for you and means you no harm at all. The final, finished Lady Lilith looks like she will eat you alive if she can be bothered to look away from her own reflection for a few minutes. When people talk about chalks and Fanny, they tend to mean this image. It is possibly the most famous of his chalk pictures of Fanny and is very pretty indeed. 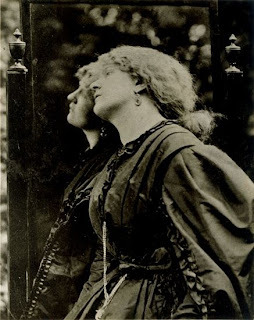 I have read many times how flattering this image is, as if by 1868 Fanny couldn't be pretty still, being all fat and knocking on a bit (at early 30s) and how he was buying her silence with pictures for her to sell. What nonsense and how insulting to reduce the relationship of two people to such a crude smudge. I think it is a warm and comforting image of someone he was extremely fond of. Seated in a similar fashion to Lady Lilith, here we have the glorious Fanny with a fan (pun-tastic!) looking magnificent. I always imagine her in a white frock, possibly due to her being described in one in William Allingham's Diary, chasing the peacocks in Rossetti's back garden. She looks out at us with challenge and I often think she is saying 'Go on, just try and shift me!' This is a picture of Fanny, the adversary and I don't fancy the chances of anyone coming up against her. Obviously I'm going to finish with the trio of chalks from 1874 because they are brilliant and I can't just feature just one. Firstly, we have Fanny in her frilly lace collar, looking respectable. That great wheel of hair plaited over her head gets me every time. It's such a chunky braid, you can almost feel the weight of it, crowning her. I love this picture of her, looking to the other side, her expression sharp. 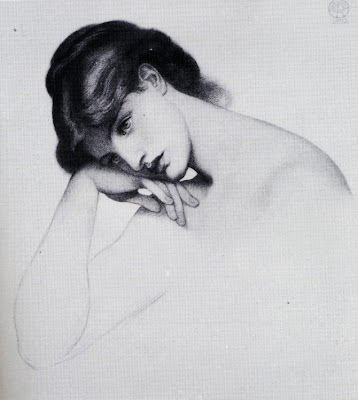 She was still so beautiful, even if he had romanticised her (as he did with all the women). The thing I love about the final chalks is that they were life size, if not bigger, so when you see them, it's like you are looking at Fanny and she is looking back. Again, it is said that he drew these for her to sell, but she kept them for a long time so I doubt that to be the whole story. If I had to declare a favourite, it might be this one, where she is nudey and pink. Again her incredible hair is what draws me to her, just the sheer quantity of it. At this point in their relationship, she had reclaimed him once more from his 'affair' with Jane, but she had won him back in a sorry state. Rather than these being a pay-off, I wonder if they are a thank you for being there when he limped home. His eyes were failing him, his mind was failing him, but she never would. Back to the start of Fanny's career and I think this is arguably the picture that Rossetti drew the evening/morning he took Fanny back to his studio and put her head against the wall for 'the calf picture'. Unlike the more dramatic expression of the finished oil, this woman has a look of exhaustion and sorrow rather than crippling shame. She is turning away with sadness, a more realistic emotion than in later versions. It's understandable that she would be sad, whatever the moral stance, if she met again with her lost love, knowing that there would be no chance of reconciliation. I'd love to know how far the couple worked together on her expression, how much of the scenario he described to her, but her face in this drawing is beautiful and touching. From one end of Fanny's career to the other, this is a study for the final oil painting she appeared in, The Blue Bower. 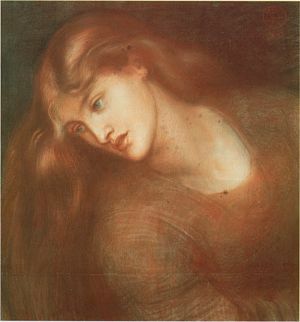 Much is made of why Rossetti stopped using Fanny, and the main thrust of the argument is that she had grown unattractive. Here is a sketch from that time and her beauty is still very much in evidence in my opinion. She has a very 'matter-of-fact' expression as if to say 'Of course I'm beautiful! And?' which I think says something of Fanny's character in the 1860s. 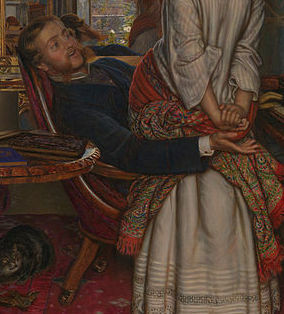 The painting was conceived in around 1863, at the pinnacle of Fanny's reign, and she couldn't have been more secure. 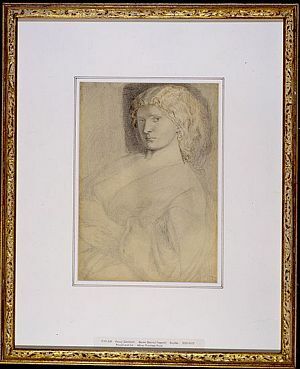 I love the fact that Boyce owned this picture and the other sketches done for the oil; he had known her for around 10 years at this point, and he too still found her beautiful. I like to think this was one of the happiest periods of her life when she was the goddess they all adored. 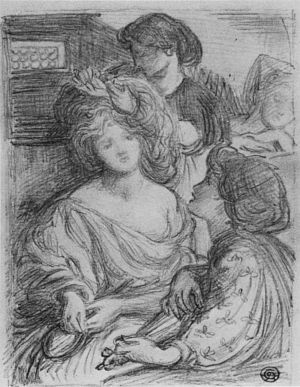 Talking of goddesses, this drawing always reminds me of the story where Rossetti was describing Fanny's finer points to a friend, pointing to her various attributes as she reclined on the sofa. When he had finished Fanny merely laughed and told him not to be so silly. She may have looked like a goddess but her feet were firmly placed on the ground. 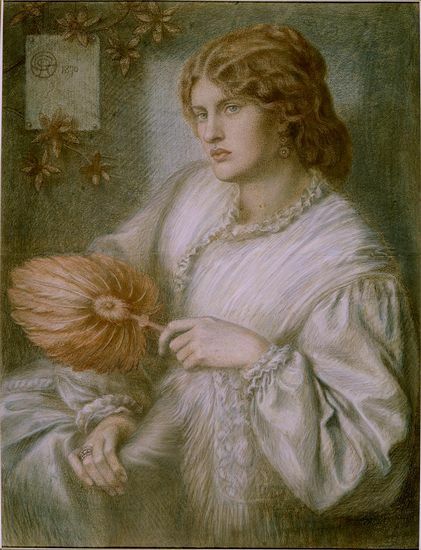 I came to this picture late, discovering it in Maria Benedetti's catalogue of Rossetti's work (bought because I was never going to be able to afford the Surtees volumes). Part of me finds it hard to imagine it is actually Fanny as it is so different to the rest of his images of her, but there are a couple of other pictures which resemble it, one of which is a pastel I'll feature tomorrow. 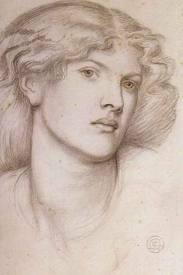 Part of me thinks it looks completely unlike Rossetti's normal work, I mean look at the lips! However, she has the ivory tower of a neck that marks her as a Stunner. It is a picture that redefines 'delicate', not a word that is usually used to describe Fanny. 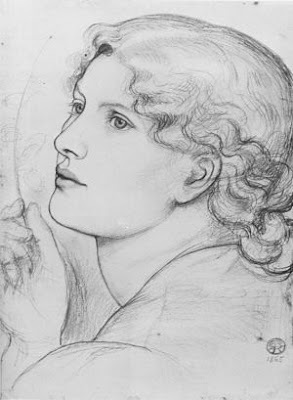 Again, a picture I wasn't familiar with until recently, this pencil, pen and ink sketch is from after the point when Fanny ceased to be Rossetti's muse. 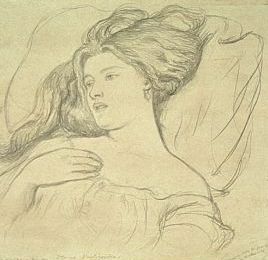 After 1865 it was thought that any images produced of her were vanity pictures for her to sell, but this seems to be a portrait drawn for a specific purpose. Possibly a sketch for Monna Vanna (it has the same luxurious, Venetian feel) or a painting that was abandoned in his obsession with Jane Morris, I think this image shows reason to doubt the convenient narrative supplied in some art histories. As I always say, never stop asking questions. 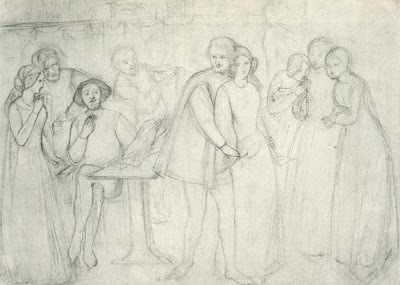 Finally today, here is a sketch by Ned Burne-Jones, done during Fanny's hiatus with Rossetti due to his marriage. I think Burne-Jones catches Fanny's beauty perfectly, and his level of finish is astonishing. The Fanny he shows us here is straight from Rossetti: the thick white neck, the folds of fabric and the great tumble of hair. Her companion is considering the game, but you feel that Fanny is considering the future and another man. Right then, same drill as yesterday, leave your votes or suggestions below, at The Stunner's Boudoir on Facebook or direct to me at stonellwalker@googlemail.com. Tomorrow I'll give you the third and last set of images to vote on, those delicious pastels and charming chalks that I always rave about. Hello Chaps! 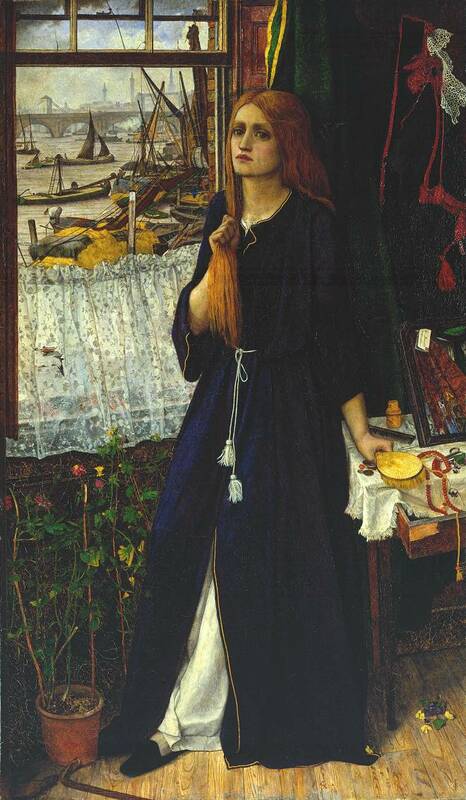 You may or may not know that Sunday 8th September is Pre-Raphaelite Brotherhood Day (or #PRBDay for Tweeters) and there will be all manner of shenanigans this year as it is also 25th Anniversary of the Pre-Raphaelite Society here in Great Britain! Goodness, cake all round! 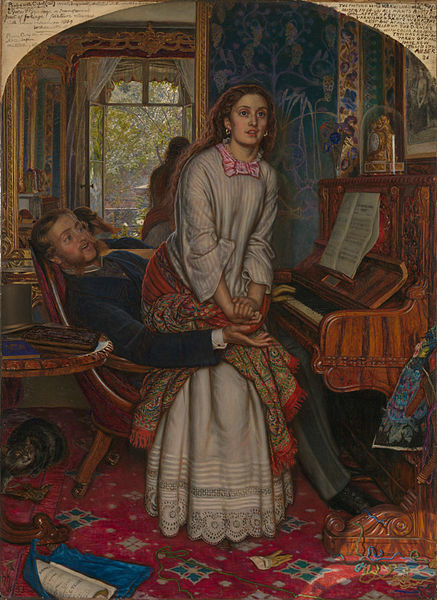 Anyway, last year there was a poll of people's favourite Pre-Raphaelite painting on Twitter, but I though it might be fun to have a little vote on here. Obviously, I want to hold a Fanny Vote. Over the next few days I will be posting up some pictures of Fanny Cornforth and I'd like you to either post your vote here, on the Stunner's Boudoir page on Facebook, or by email (stonellwalker@googlemail.com) and on Sunday 8th September I shall reveal your favourite images of Madam Cornforth! Such larks! 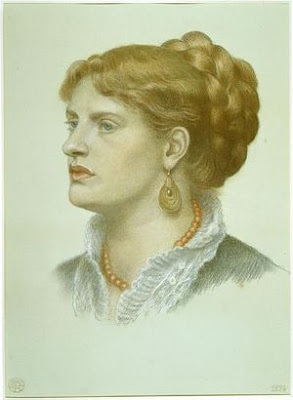 Okay, today we shall start with the oil and watercolour paintings of Fanny. Here are a few suggestions but feel free to shout out some more. 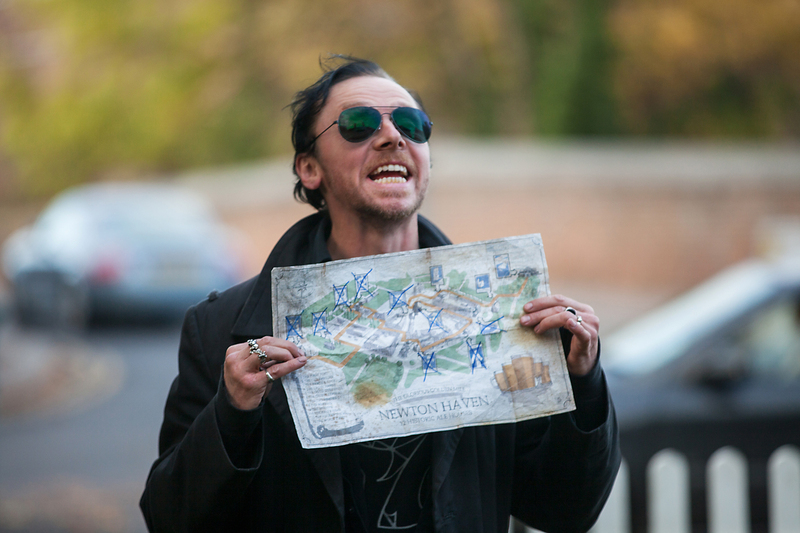 Any you suggest that aren't illustrated here I'll pop up on the Stunner's Boudoir! 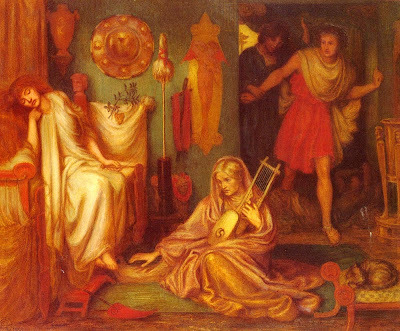 The figures were finished, but the rest of the canvas was neglected as Rossetti fell out of love with the subject. After all, why should the prostitute feel any shame when the woman who modelled for her didn't seem to. Is this a more realistic portrait then? Ah, the Kissed Mouth! There is a girl who is fond of a kiss and fond of a guinea. 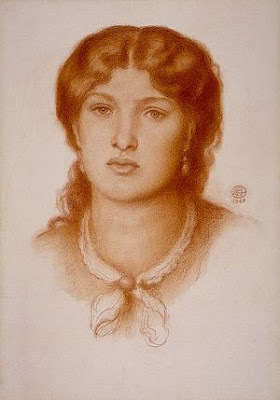 While this is often thought to be a 'portrait', it really isn't, it's another part that she played in Rossetti's mind. Here we have Fanny as the luxurious, sexual equal, constantly waiting to be embraced. It has the look of a fire-lit portrait, as if he painted her one evening as they sat by the fireside and she thought about the future. I love her expression, distracted, hidden, absorbed. She looks like she is already worrying about her lover but he is too blind to see it, even as he paints her. Despite my love of the little circle portrait, it doesn't mean that I don't love his other major oils of Fanny between 1860 and 1865. Fazio's Mistress is such a 'senior' work, by which I mean it looks like there is no doubt in Rossetti's eye that this was what he imagined and wanted. 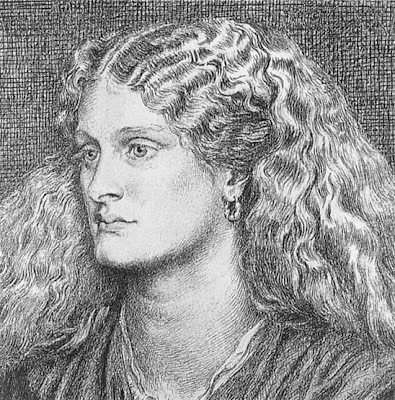 Fanny inhabits a role of certainty, binding her hair into plaits as surely as she binds her lover to her. All is luxury and excess, all is fantasy and warmth. 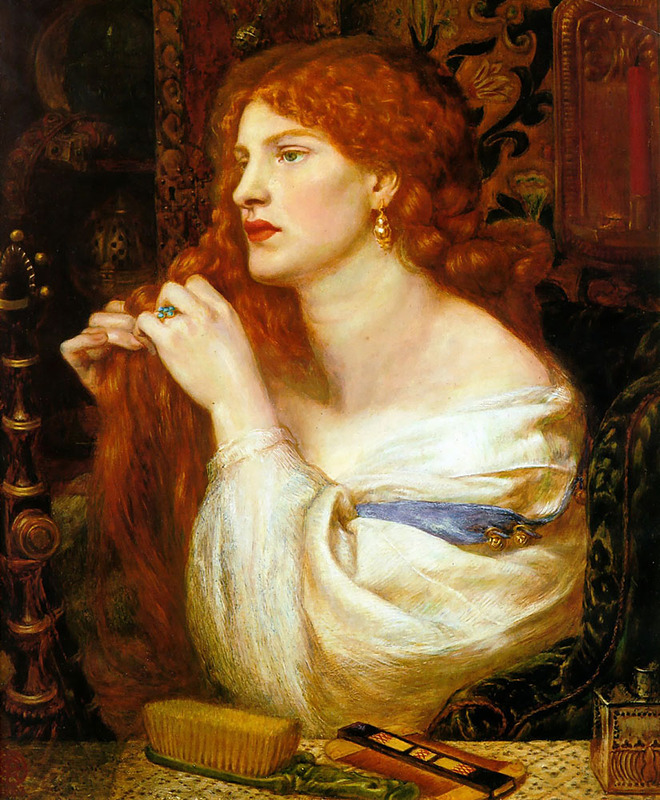 I didn't realise that Woman Combing her Hair is often known as Fazio's Mistress as well. 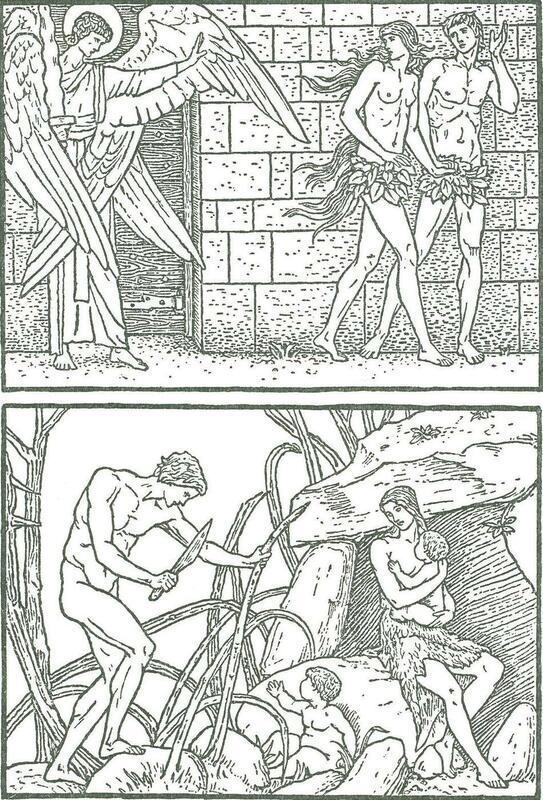 I link it more readily with Lady Lilith in my mind, but all are images of women preparing their hair for the male gaze. 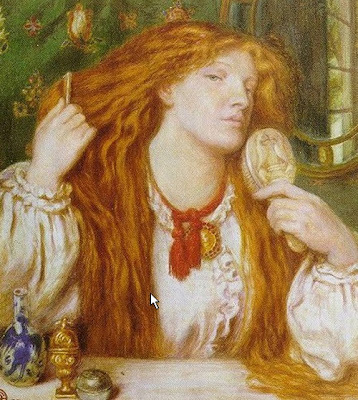 I love the colour of Fanny's hair in the watercolour of her combing her hair, so rich and gingery, clashing with the red at her neck. It is a picture of excess, but has a tension rather than the relax of luxury. She seems to have almost too much hair, trapped under her elbow and catching in the comb. The woman seems to shy back but is trapped in the small space, cluttered by bric-a-brac and her own physical opulence. Talking of opulence, this is a painting I would merrily steal. 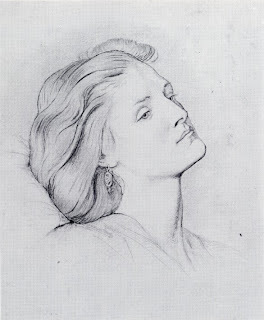 It is one of my favourites yet I often overlook it when talking of Fanny's career as it is tucked away in the period of the Rossetti marriage. 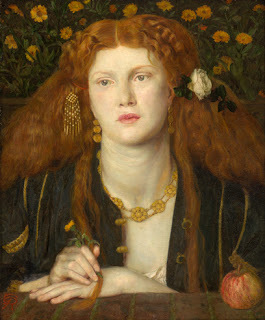 At first glance it is a traditional waiting maiden, one of Rossetti's many women who seem to exist to loiter. Look closer and the flush on her cheek and chest is almost indecent. She is all pink and blush, feeling the excitement grow as the cord her lover is following tightens. The green glass around her highlights that rosy tint, and all of her is blood and heat. Look at the roses on her dress and how they reflect the one caught in her hair. Exquisite! Last but not least is the painting it is impossible to reproduce. The Blue Bower is a riot of blue and green, sharp and fresh, and I've never seen Fanny's skin look so clear and pale, like china. The use of flowers in the canvas drives me to plant up my garden with cornflowers and passion flowers and it is at once cheeky and classy. Plus she has one of the most delicious hairclips I have ever seen. 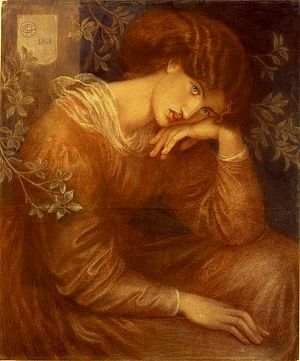 This is Fanny's swan-song from Rossetti's eye, neglected back to a 'practice muse' after this, but it is a hell of a finale. Right then, I need you to vote for your favourite oil, either on this page, on the Stunner's Boudoir on Facebook (I will have a link to this post and you can leave comments below it) or you can email me direct with your vote or if you have any other suggestions. Tomorrow will be pencil and pen drawings and Wednesday will be chalks, and you have until Saturday 7th September to cast your vote in all three categories. Your favourite pictures will be revealed on PRB Day on the 8th! For Fanny's sake, get voting! 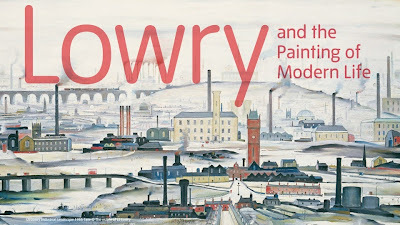 Despite my ambivalence to matchstick men and industrial landscapes, I have followed the press coverage of the exhibition with interest because of L S Lowry's dark and shameful secret. 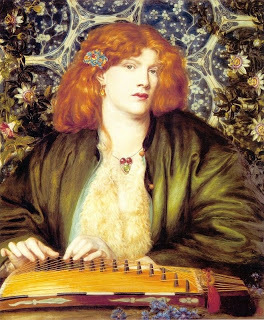 He loved Pre-Raphaelite art. Shocking. What's a nice modern artist like Lowry doing with a bluff old Victorian like Rossetti? 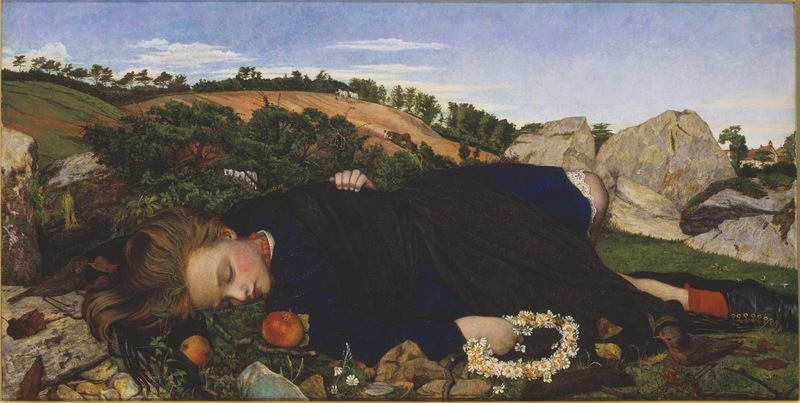 If you think about Lowry's age and where he came from, then his love of the Pre-Raphaelites is less amazing. 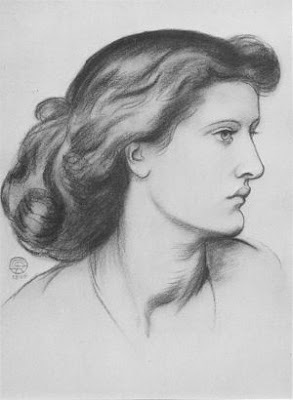 Born in 1887, he grew up among the ideas of William Morris and Edward Burne-Jones, artists who were held in esteem at the evening art class he attended. 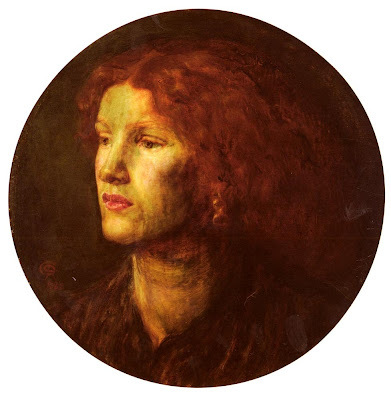 He visited the 1911 Pre-Raphaelite exhibition in Manchester and then another smaller one of just Rossetti and Ford Madox Brown's portraits in 1920, together with the Brown murals in the Town Hall. He claimed, possibly apocryphally, that as a small boy he was taken to see Brown paint them (he would have been 5 years old at the time). That was it for him. His love for Brown and Rossetti never wavered for the rest of his life. Lowry followed up his initial Rossetti purchase with two more, two years later. He purchased The Laurel, a portrait of Agnes Manetti or Ada Vernon from the mid 1860s. He purchased it as Portrait of a Lady Seated Holding a Flower and apparently he liked the hands but felt the mouth was rather hard. 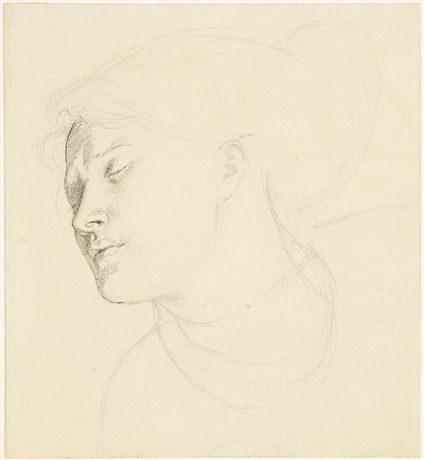 The rather more enigmatic Portrait of a Lady was a less successful picture, and reminded him of Fuseli (he didn't like Fuseli). He ended up hiding it under his bed as he did not like it enough to see it on a regular basis. I would argue that it was again Fanny, but it isn't a very good image of her, the eyes are uneven and she is doing something undignified with her right hand. Possibly best she went under the bed. 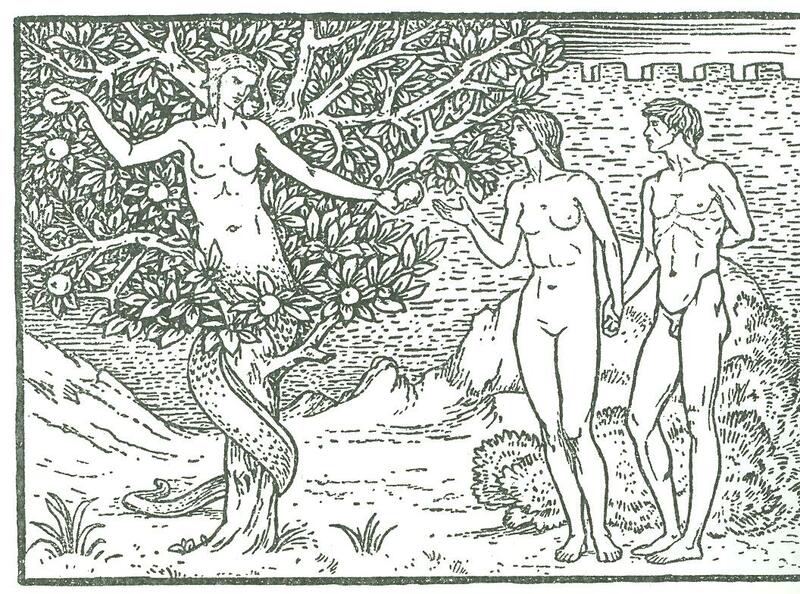 My apologies if the version of Proserpine isn't the right version, it's a nightmare trying to sort one from another. Lowry bought this oil in November 1964 and he considered it one of Rossetti finest painting, second only to Astarte Syriaca which he had admired in Manchester (as have I, it's stunning). He hung her on the stairs, but then moved her, propping her against his wardrobe because he didn't like passing her, possibly feeling it to be unlucky. Interesting note: the copy of Proserpine currently up for auction was bought by a friend of Lowry's after they admired the artist's copy. Not everything he purchased was displayed. Morning Music and the Head of a Girl were bought but hung briefly, if at all. They, like others, ended up under his bed. One of the problems may have been that Lowry often didn't go to the sales himself but had an agent bidding for him. 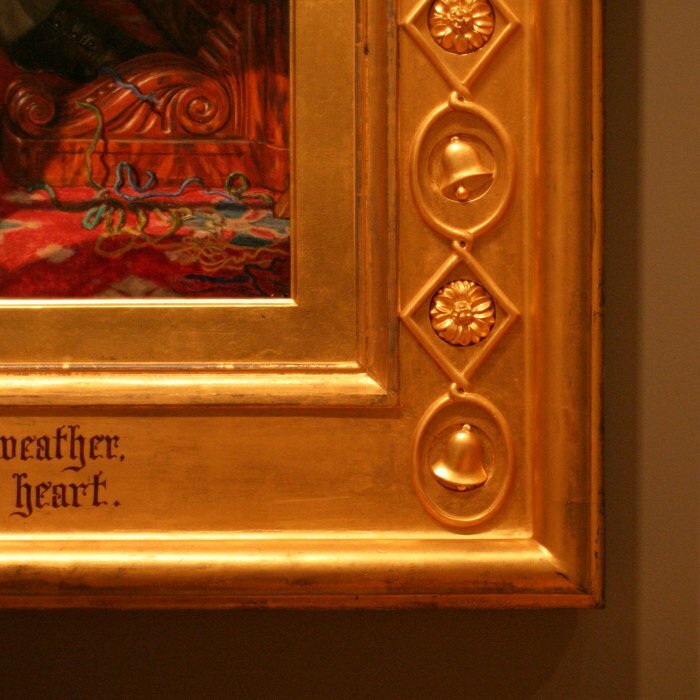 I wonder how much he felt conflicted about his love of such unfashionable art. Head of a Girl is rather lovely, I would guess a possible image of Alexa, but he didn't let her see the light for long. 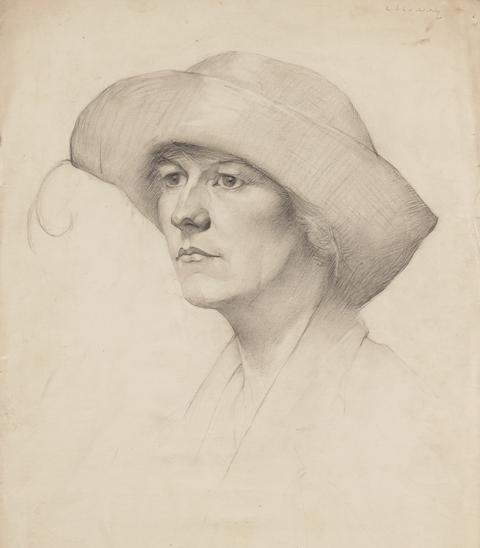 One of his favourite pictures which always hung downstairs was this sketch of Annie Miller. He hung her opposite his armchair so he would see her often. 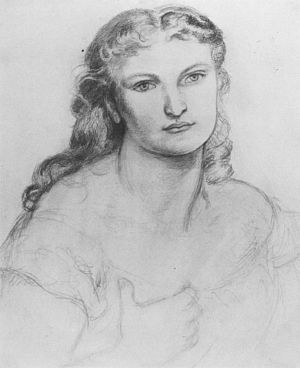 It was the 'uninhibited passion' of Rossetti that attracted him and he felt this was most vividly displayed in his pictures of women. The way he described them seems very odd, if you take into account how much he liked them: 'They're very queer creatures and I like him for it...What he puts into the individual is all him, not the individual, they're probably very ordinary people'. In 1961 he said 'I don't like his women at all, but they fascinate me, like a snake. That's why I always buy Rossetti whenever I can. His women are really rather horrible'. 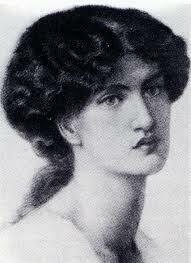 For Lowry, Jane Morris seems to be the perfect Stunner. 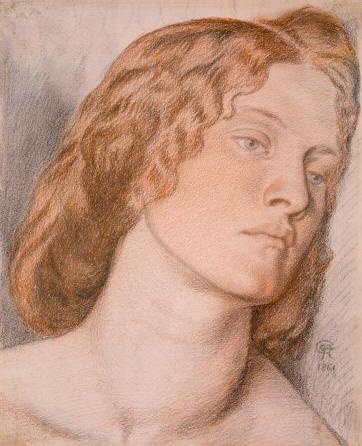 Despite his admitted 'revulsion' at the images, he had a fondness for her as he experienced her through the more 'portrait' aspects of Rossetti's art. 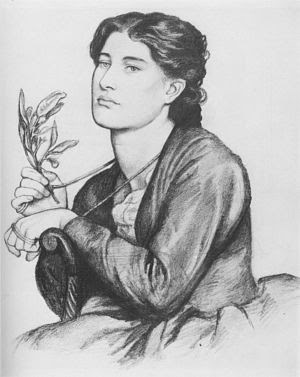 He hung this sketch in his bedroom with his Burne-Jones sketch of a woman, and always felt that there was more emotion in Jane's face than in Burne-Jones' model. 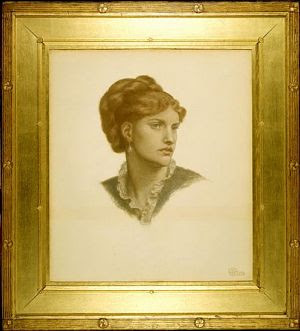 I always had a weakness for Rossetti chalks and it appears I'm in good company. 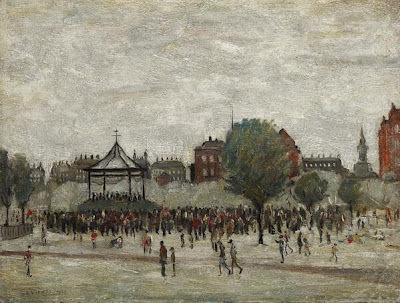 Lowry bought both of these from The Stone Gallery in Newcastle upon Tyne and remained fond of them until the end of his life. Both hung in his bedroom and he found them alluring and fascinating. 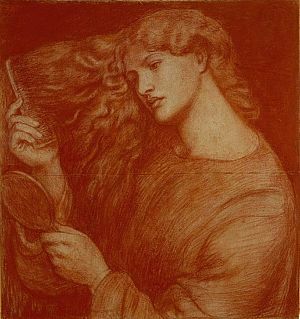 Considering Lowry's very complex relationship to Rossetti's work it seems unsurprising that he would be drawn to the artist's most 'complex' muse, a punishing, reflective, sorrowful goddess, who needs you but you are unable to reach. 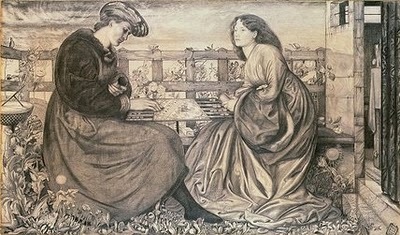 Lowry said that although he admired the work of Ford Madox Brown above all artists, definitely above Rossetti, he liked Rossetti on a personal level and felt a connection to the man and his art. 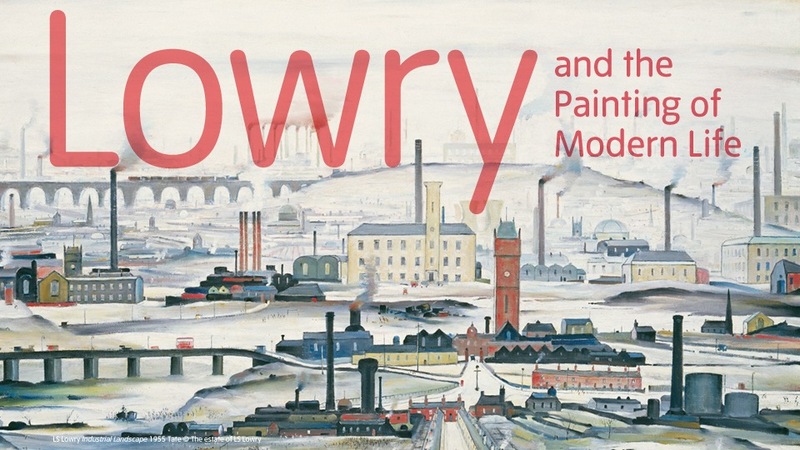 It is impossible to see a direct link between Lowry's images of the industrial landscape of the North West of England and a painting such as Proserpine but then I read and enjoy many books that I would have no intention of writing myself. 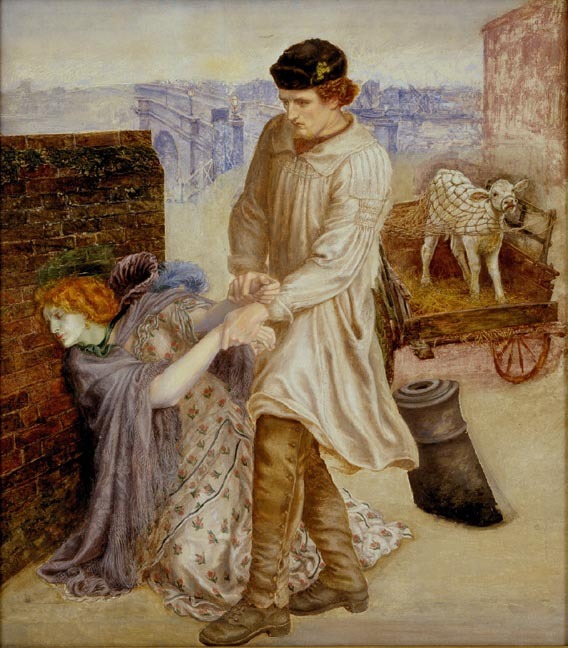 Maybe Lowry felt that Rossetti alone could make those images, that there was a special interplay between muse and artist that would be pointless to reproduce, so he had no interest in painting in either the style or the subject. In the end, Lowry claimed that Rossetti was the only artist whose work he really wanted to own (despite his collection of many other works). 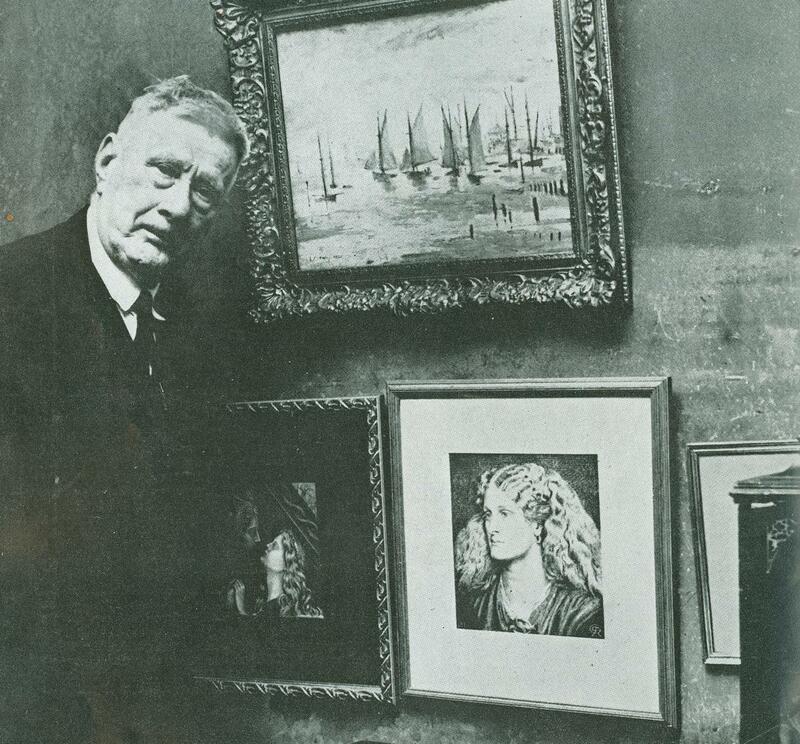 Maybe that seeming conflict between Lowry's work and Rossetti's was one of the allures that drew him to collect. The Tate exhibition runs until 20th October and further details can be found here. Further information about L S Lowry, including an exhibition on previously unseen work, can be found here.